We hope everyone had a relaxing and enjoyable Labor Day weekend! As summer turns to fall and the weather gets crisp and cool, it’s the perfect time to get outdoors and take in the fresh air. We’ve certainly enjoyed spending time outside at our new Discovery Point Heritage center and are happy to say that the campus is growing greener and greener every day! It’s lovely to add some green around our center, and the build-out is progressing by leaps and bounds! 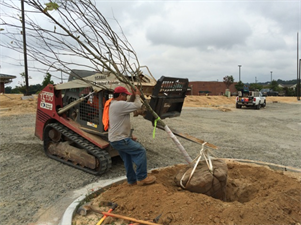 We’re planting trees and expecting the grass, mulch and big canopy soon. Then the only thing missing is the children who will be playing and learning at our brand new center!